Sponges lack true tissues, have no body symmetry, and are sessile; types are classified based on presence and composition of spicules. As larvae, sponges are able to swim, but as adults, they are sessile, spending their life attached to a substrate. Although the majority of sponges live in marine habitats, one family, the Spongillidae, is found in fresh water. Calcarea, Hexactinellida, Demospongiae, and Homoscleromorpha make up the four classes of sponges; each type is classified based on the presence or composition of its spicules or spongin. Most sponges reproduce sexually; however, some can reproduce through budding and the regeneration of fragments. The majority of sponges are filter-feeders, but a few species are carnivorous due to the nutrient -poor environment in which they are found. The invertebrates, or Invertebrata, are animals that do not contain bony structures such as the cranium and vertebrae. The simplest of all the invertebrates are the Parazoans, which include only the phylum Porifera. Phylum Porifera (“pori” = pores, “fera” = bearers) are popularly known as sponges. Sponge larvae are able to swim; however, adults are non-motile and spend their life attached to a substratum through a holdfast. The majority of sponges are marine, living in seas and oceans. There is, however, one family of fresh water sponges (Family Spongillidae). The great majority of the marine species can be found in ocean habitats ranging from tidal zones to depths exceeding 8,800 m (5.5 mi). Sponges are classified within four classes: calcareous sponges (Calcarea), glass sponges (Hexactinellida), demosponges (Demospongiae), and the recently-recognized, encrusting sponges (Homoscleromorpha). The presence and composition of spicules and spongin are the differentiating characteristics between the classes of sponges. Demosponges, which contain spongin and may or may not have spicules, constitute about 90% of all known sponge species, including all freshwater ones, and have the widest range of habitats. Calcareous sponges, which have calcium carbonate spicules and, in some species, calcium carbonate exoskeletons, are restricted to relatively shallow marine waters where production of calcium carbonate is easiest. They contain no spongin. Hemoscleromorpha sponges tend to be massive or encrusting in form and have a very simple structure with very little variation in spicule form (all spicules tend to be very small). Hexactinellid sponges have sturdy lattice-like internal skeletons made up of fused spicules of silica; they tend to be more-or-less cup-shaped. Sponge Spicule: Sponges are classified based on the presence and types of spicules they contain. Types of sponges: (a) Clathrina clathrus belongs to class Calcarea, (b) Staurocalyptus spp. (common name: yellow Picasso sponge) belongs to class Hexactinellida, and (c) Acarnus erithacus belongs to class Demospongia. Unlike Protozoans, the Poriferans are multicellular. However, unlike higher metazoans, the cells that make up a sponge are not organized into tissues. Therefore, sponges lack true tissues and organs; in addition, they have no body symmetry. Sponges do, however, have specialized cells that perform specific functions. The shapes of their bodies are adapted for maximal efficiency of water flow through the central cavity, where nutrients are deposited, and leaves through a hole called the osculum. Many sponges have internal skeletons of spongin and/or spicules of calcium carbonate or silica. Primarily, their body consists of a thin sheet of cells over a frame (skeleton). As their name suggests, Poriferans are characterized by the presence of minute pores called ostia on their body. Since water is vital to sponges for excretion, feeding, and gas exchange, their body structure facilitates the movement of water through the sponge. Structures such as canals, chambers, and cavities enable water to move through the sponge to nearly all body cells. Most species use sexual reproduction, releasing sperm cells into the water to fertilize ova that in some species are released and in others are retained by the “mother. ” The fertilized eggs form larvae which swim off in search of places to settle. Sponges are also known for regenerating from fragments that are broken off, although this only works if the fragments include the right types of cells. A few species reproduce by budding. When conditions deteriorate, such as when temperatures drop, many freshwater species and a few marine ones produce gemmules: “survival pods” of unspecialized cells that remain dormant until conditions improve. They then either form completely new sponges or recolonize the skeletons of their parents. Most of the approximately 5,000–10,000 known species of sponges are filter-feeders, feeding on bacteria and other food particles in the water. However, a few species of sponge that live in food-poor environments have become carnivores that prey mainly on small crustaceans. Other species host photosynthesizing micro-organisms as endosymbionts; these alliances often produce more food and oxygen than they consume. Instead of true tissues or organs, sponges have specialized cells that are in charge of important bodily functions and processes. Although sponges do not have organized tissue, they depend on specialized cells, such as choanocytes, porocytes, amoebocytes, and pinacocytes, for specialized functions within their bodies. The mesohyl acts as a type of endoskeleton, helping to maintain the tubular shape of sponges. Porocytes control the amount of water that enters pores into the spongocoel, while choanocytes, which are flagellated cells, aid the movement of water through the sponge, thereby helping the sponge to trap and ingest food particles. Amoebocytes carry out several special functions: they deliver nutrients from choanocytes to other cells, give rise to eggs for sexual reproduction, deliver phagocytized sperm from choanocytes to eggs, and can transform into other cell types. Collencytes, lophocytes, sclerocytes, and spongocytes are examples of cells that are derived from amoebocytes; these cells manage other vital functions in the body of sponges. The morphology of the simplest sponges takes the shape of a cylinder with a large central cavity, the spongocoel, occupying the inside of the cylinder. Water can enter into the spongocoel from numerous pores in the body wall. Water entering the spongocoel is extruded via a large, common opening called the osculum. However, sponges exhibit a range of diversity in body forms, including variations in the size of the spongocoel, the number of osculi, and where the cells that filter food from the water are located. Sponge morphology: The sponge’s (a) basic body plan is a cylinder shape with a large central cavity. The specialized cell types in sponges (b) each perform a distinct function. While sponges (excluding the Hexactinellids) do not exhibit tissue-layer organization, they do have different cell types that perform distinct functions. Pinacocytes, which are epithelial-like cells, form the outermost layer of sponges, enclosing a jelly-like substance called mesohyl. Mesohyl is an extracellular matrix consisting of a collagen -like gel with suspended cells that perform various functions. The gel-like consistency of mesohyl acts as an endoskeleton, maintaining the tubular morphology of sponges. In addition to the osculum, sponges have multiple pores called ostia on their bodies that allow water to enter the sponge. 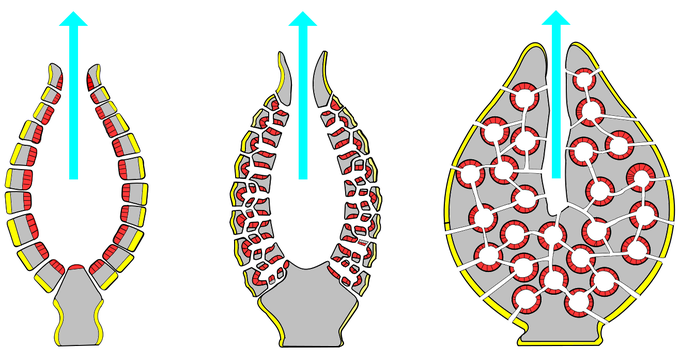 In some sponges, ostia are formed by porocytes: single, tube-shaped cells that act as valves to regulate the flow of water into the spongocoel. In other sponges, ostia are formed by folds in the body wall of the sponge. Choanocytes (“collar cells”) are present at various locations, depending on the type of sponge; however, they always line the inner portions of some space through which water flows: the spongocoel in simple sponges; canals within the body wall in more complex sponges; and chambers scattered throughout the body in the most complex sponges. Whereas pinacocytes line the outside of the sponge, choanocytes tend to line certain inner portions of the sponge body that surround the mesohyl. The structure of a choanocyte is critical to its function, which is to generate a water current through the sponge and to trap and ingest food particles by phagocytosis. Note that there is a similarity in appearance between the sponge choanocyte and choanoflagellates (Protista). This similarity suggests that sponges and choanoflagellates are closely related and probably share a recent, common ancestry. The cell body is embedded in mesohyl. 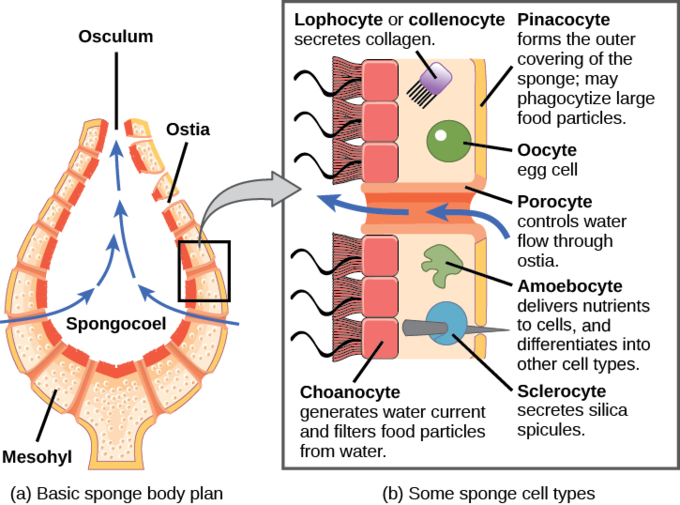 It contains all organelles required for normal cell function, but protruding into the “open space” inside of the sponge is a mesh-like collar composed of microvilli with a single flagellum in the center of the column. The cumulative effect of the flagella from all choanocytes aids the movement of water through the sponge: drawing water into the sponge through the numerous ostia, into the spaces lined by choanocytes, and eventually out through the osculum (or osculi). Meanwhile, food particles, including waterborne bacteria and algae, are trapped by the sieve-like collar of the choanocytes, slide down into the body of the cell, are ingested by phagocytosis, and become encased in a food vacuole. Finally, choanocytes will differentiate into sperm for sexual reproduction; they will become dislodged from the mesohyl, leaving the sponge with expelled water through the osculum. The second crucial cells in sponges are called amoebocytes (or archaeocytes), named for the fact that they move throughout the mesohyl in an amoeba-like fashion. Amoebocytes have a variety of functions: delivering nutrients from choanocytes to other cells within the sponge; giving rise to eggs for sexual reproduction (which remain in the mesohyl); delivering phagocytized sperm from choanocytes to eggs; and differentiating into more-specific cell types. Some of these more-specific cell types include collencytes and lophocytes, which produce the collagen-like protein to maintain the mesohyl; sclerocytes, which produce spicules in some sponges; and spongocytes, which produce the protein spongin in the majority of sponges. These cells produce collagen to maintain the consistency of the mesohyl. Sponges are sessile, feed by phagocytosis, and reproduce sexually and asexually; all major functions are regulated by water flow diffusion. Choanocytes trap bacteria and other food particles from water flowing within the sponge: in through the ostia and out through the osculum; particles are ingested by phagocytosis. Sponges reproduce by sexual and asexual methods, which include fragmentation or budding; the production of gemmules is another asexual reproduction method, but is found only in freshwater sponges. Sponges are monoecious; depending on the species, production of gametes may be continuous through the year or dependent on water temperature. In nature, sponges are sessile as adults; however, under laboratory conditions, sponge cells are capable of localized creeping movements through organizational plasticity. Gas exchange, circulation, and excretion are other major body functions in the sponge; these are achieved through the diffusion of water through the sponge body. Sponges, despite being simple organisms, regulate their different physiological processes through a variety of mechanisms. These mechanisms regulate metabolism, reproduction, and locomotion. All other major body functions in the sponge (gas exchange, circulation, excretion) are performed by diffusion between the cells that line the openings within the sponge and the water that is passing through those openings. All cell types within the sponge obtain oxygen from water through diffusion. Likewise, carbon dioxide is released into seawater by diffusion. In addition, nitrogenous waste produced as a by-product of protein metabolism is excreted via diffusion by individual cells into the water as it passes through the sponge. Water flow in a sponge: In a sponge, water enters through the body pores and exits in the direction of the osculum (direction of blue arrow). This diffusion of water through the body supports major functions in the sponge. Sponges reproduce by sexual, as well as, asexual methods. The typical means of asexual reproduction is either fragmentation (where a piece of the sponge breaks off, settles on a new substrate, and develops into a new individual) or budding (a genetically-identical outgrowth from the parent eventually detaches or remains attached to form a colony). An atypical type of asexual reproduction is found only in freshwater sponges, occurring through the formation of gemmules. Gemmules are environmentally-resistant structures produced by adult sponges wherein the typical sponge morphology is inverted. In gemmules, an inner layer of amoebocytes is surrounded by a layer of collagen (spongin) that may be reinforced by spicules. The collagen that is normally found in the mesohyl becomes the outer protective layer. In freshwater sponges, gemmules may survive hostile environmental conditions such as changes in temperature. They serve to recolonize the habitat once environmental conditions stabilize. Gemmules are capable of attaching to a substratum and generating a new sponge. Since gemmules can withstand harsh environments, are resistant to desiccation, and remain dormant for long periods, they are an excellent means of colonization for a sessile organism. Sexual reproduction in sponges occurs when gametes are generated. Sponges are monoecious (hermaphroditic), which means that one individual can produce both gametes (eggs and sperm) simultaneously. In some sponges, production of gametes may occur throughout the year, whereas other sponges may show sexual cycles depending upon water temperature. Sponges may also become sequentially hermaphroditic, producing oocytes first and spermatozoa later. Oocytes arise by the differentiation of amoebocytes and are retained within the spongocoel, whereas spermatozoa result from the differentiation of choanocytes and are ejected via the osculum. Ejection of spermatozoa may be a timed and coordinated event, as seen in certain species. Spermatozoa carried along by water currents can fertilize the oocytes borne in the mesohyl of other sponges. Early larval development occurs within the sponge; free-swimming larvae are then released via the osculum. Sponges are generally sessile as adults and spend their lives attached to a fixed substratum. They do not show movement over large distances as do free-swimming marine invertebrates. However, sponge cells are capable of creeping along substrata via organizational plasticity. Under experimental conditions, researchers have shown that sponge cells spread on a physical support demonstrate a leading edge for directed movement. It has been speculated that this localized creeping movement may help sponges adjust to microenvironments near the point of attachment. It must be noted, however, that this pattern of movement has been documented in laboratories, but it remains to be observed in natural sponge habitats.